Harder to define than you supposed. So no one understands what a book is in large part because we operate with very different definitions jostling against one another in our minds; and also because, even if we think only in terms of the technologies of writing, these technologies have changed a great deal throughout the history of writing and are changing at an unprecedentedly rapid pace today. 2. 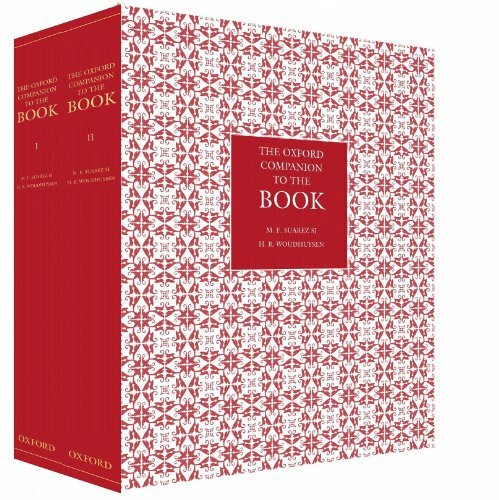 These reflections should help us come to terms with both the achievement and the limitations of The Oxford Companion to the Book, a beautiful two-volume set edited by Michael Suarez, SJ, and H. R. Woudhuysen. The set is divided into two major sections, which do not quite correspond to the volumes: a set of 48 largely historical essays takes up most of the first volume, while the rest of that volume and the whole of the second yields a dictionary. There you may find entries on printing techniques, instruments used in printing (press stones, mallets), certain famous books (the Codex Sinaiticus, Scouting for Boys), publishers, book collectors, legal terms, and a great many other things. One of my favorite entries, so far, is that for one Samuel Paterson (1728-1802), identified as "an unsuccessful English bookseller (because, he said, he preferred reading his books to selling them)." Surely this entry strikes a blow against our culture's worship of success, and, moreover, gives proper acknowledgement of the fate that has always befallen the greater part of the bookselling trade. book (1) A word that has long been used interchangeably and variously to signify any of the many kinds of text that have been circulated in written or printed forms, and the material objects through which those words and images are transmitted. The ancestor of the modern word 'book' is used in both senses in Anglo-Saxon documents. This Oxford Companion to the Book is a book in the abstract, non-corporeal sense (and can be thus described in its Internet manifestation), and also in the physical sense of a three-dimensional object in codex format. Books in that first sense have been manifested in the second one in a wide variety of shapes and sizes from ephemera … to elephant folios, using many different materials. Just as I have tried to distinguish between the book as a particular technology of writing and the book as a concept involving fullness of expression, the author here (David Pearson, one of the Companion's associate editors) makes a distinction between the physical object and … well, what, exactly? "Any of the many kinds of text that have been circulated in written or printed forms"—but that's not very helpful. Pearson seems to be distinguishing in as purely abstract a way as possible the physical book from whatever goes in a physical book. But this raises the question of what does go into a physical book. "Words and images," apparently. But this does not get us very far. Nor does this definition enable us to make everyday distinctions such as the one I mentioned earlier between the book and the magazine, or, for that matter, between books and letters: that may have been a lengthy missive Mr. Darcy wrote to Elizabeth Bennett, but no one would call it a book. And indeed the Companion's dictionary contains rather lengthy entries on "magazine, origins of" and "letter." It is at this point that one is forced to conclude that The Oxford Companion to the Book is a seriously misleading title: it should rather be called The Oxford Companion to the Written Word, for this is its true subject. (More accurate still would be The Oxford Companion to the Written Word and the Images That Sometimes Accompany It, but one can reasonably ask only so much from a title.) The concept of the book that I tried to articulate in the opening paragraphs of this essay is, as far as I have been able to discover, not referred to in any way in the whole of this reference. In one sense this may be defensible. We probably need a Companion to the Written Word, in its glorious diversity, more than a Companion to the Book. But someone needs to try to define and, I think, defend the concept of a book as an ambitious, relatively large-scale work of story or argument. For this concept is under some attack these days, by implicit and explicit means. It's certainly true that there are too many books, and that (in the realm of scholarship especially) many ideas that deserve to be treated at essay-length have been unnaturally expanded to fill the space between covers, but it is manifestly not the case that, as some have quite seriously suggested, books can simply be replaced by blog posts, or by blog-like media in which ideas are presented as they develop, are visibly and publicly revised, and are not finished but rather, at some point, abandoned.